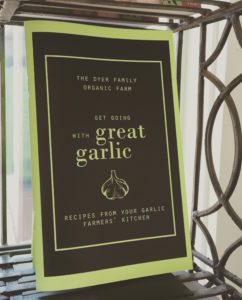 Our farm has published its first book: Get Going with Great Garlic: Recipes from your garlic farmers’ kitchen, which includes all the recipes on this website and MORE! From appetizers to desserts, all recipes include garlic. All the recipes are flavorful, fun, and easy to prepare as your garlic farmers (us!) do not have hours and hours to shop, prepare, or clean up, just like all of you. The ordering information and page is simple at this point with more to come (i.e. pretty pictures, on-line ordering with credit cards) when we have time to figure all that out over the winter. The cost for each book is $5.00. Shipping/handling is $3.00 for the first book plus $1.00 for each additional book, all books being mailed to the same address (Special Note: orders only mailed to US addresses at this time). Please mail checks (made out to The Dyer Family Organic Farm) to us, and we will mail the books directly to you. Book orders will be filled once each week, with the orders readied for shipment on Sunday evenings. Sorry – no rush orders are possible ……..Make sure to tell us how many books you are ordering and the address to use for shipping. Feedback from our current garlic customers has been very positive! 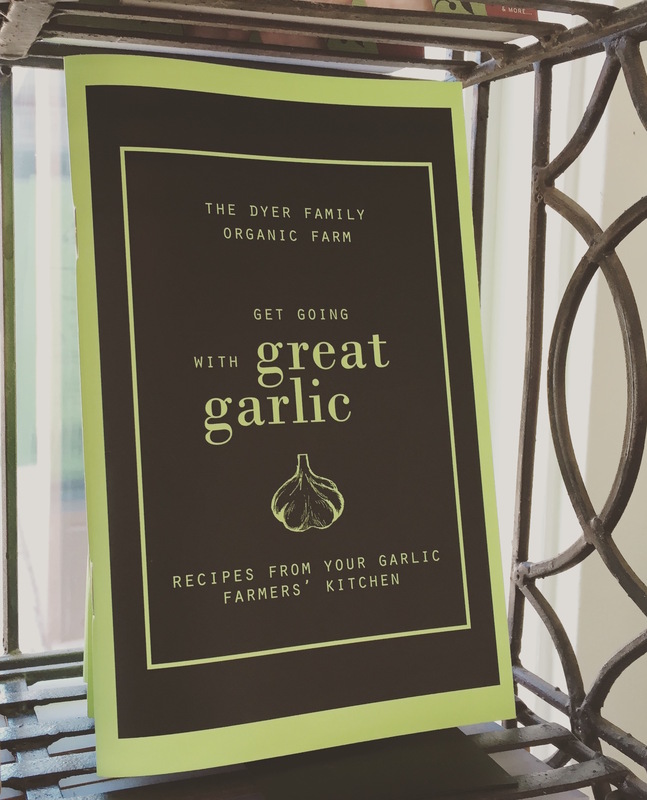 The book is meant to get you cooking, having fun, using great-flavored garlic! People have already been buying several books to give as gifts, so think ahead for your holidays plus year-round gift-giving opportunities. Thank you, thank you, for buying our book and supporting small local organic farms, working to nourish the health of our communities – healthy soil grows healthy food, which nourishes healthy people who create healthy communities and protect and preserve a healthy planet.